Democrats and Republicans can’t even agree on the definition of a border wall — let alone the project itself — and the rift could lead to a partial government shutdown later this month. Senators came to a bipartisan agreement this summer to provide $ 1.6 billion for 65 miles of a beefed-up barrier along the Southwest border. While not enough for President Donald Trump, the deal marked a breakthrough on an otherwise intractable fight over the president’s chief campaign promise. 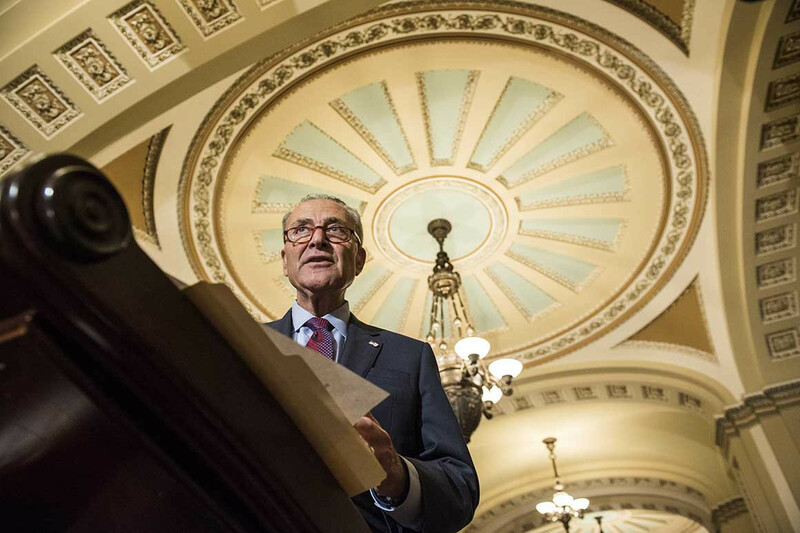 That has led Senate Minority Leader Chuck Schumer to argue that the bill gives Trump zero dollars for the “wall” and instead provides for “border security,” even as some progressives urge the Senate to abandon the deal. In the face of Schumer’s stance, Republicans are defending the $ 1.6 billion pact as giving the president exactly what he’s requesting, worried that may be all that can get through the Senate and that anything more would lead to a shutdown just days before Christmas. Sen. Shelley Moore Capito (R-W.Va.), who wrote the border funding bill with Sen. Jon Tester (D-Mont.) in June, said it is “not accurate” for Schumer and Senate Democrats to claim it stiffs Trump on his beloved wall. “It’s for a wall system. It is a lot of wall, but it is also a part of a system. And then we have additional add-ons in the bill that have more manpower and more technology,” Capito said, referring to millions more for additional border security. Sen. Susan Collins (R-Maine) said the Senate needs to figure out a way to please everyone and fast: “The government can’t close,” she implored her colleagues in an interview, predicting Congress will compromise on an amount greater than $ 1.6 billion for border barriers. Whether people will call it a wall or not is another question entirely. Yet what seems like inside baseball is actually the whole ballgame to the president, who balked at signing a spending bill in March because it fell far short of his spending ambitions for the wall. He’s dug in even more this time. “Top Border Security, including a Wall, is $ 25 Billion. Pays for itself in two months. Get it done!” he tweeted this week. And Trump himself appears to be playing close attention to the debate. He’s spoken several times with Republican leaders about the matter and seems dead set on finally getting this win. Schumer sees it another way, accusing Trump of “trying to manufacture a shutdown to fire up his base.” He and House Minority Leader Nancy Pelosi (D-Calif.) are expected to meet with the president next week, in part to discuss how to fund the government. In an interview with POLITICO last week, Trump said he wants $ 5 billion for the border wall alone and additional money for border security, a sign that the president is being kept apprised of the details during the back and forth between lawmakers. The president is fixated on winning the border wall fight, putting other priorities on the back burner and raising the stakes for both parties. Senate Democrats say $ 1.6 billion was hard enough to get through the Senate Appropriations Committee; that it matches the initial White House request; and that it provides more than the $ 1.3 billion the president received for a border barrier last year. A news release accompanying the bill in June from the Appropriations Committee boasted that it “fully funds” Trump’s fiscal 2019 request for the border wall system. That measure would almost certainly pass the Senate, though House Republicans are still in the majority and have pushed for $ 5 billion for the wall. They might need Democratic votes to pass anything, leading to a stalemate that’s dragged on for a month since the election. And if Trump doesn’t get $ 5 billion for a concrete border wall, there’s no guarantee he would sign whatever Congress passes, though some lawmakers are bullish they can write the legislation to satisfy everyone. “It’s just a matter of what you call it,” said Sen. Roy Blunt (R-Mo.) of the border security funding. That’s left Republicans in a difficult place. Trump has told Senate Appropriations Chairman Richard Shelby (R-Ala.) directly that he wants three times the funding that Shelby’s committee approved. Regardless, there’s no way the GOP will concede that the bipartisan bill doesn’t meet the president’s definition of a wall. Heather Caygle and Sarah Ferris contributed to this report.